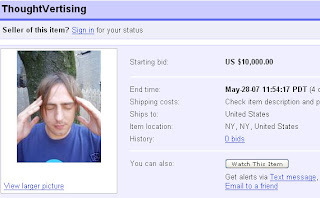 "Bid to sponsor ThoughtVertising. Successful bidder to provide me with the brand message, logo or product. Every hour on the hour for an entire week I think about your brand regardless of the social situation or circumstance." Dream Machine and Subliminal Ads?